Ensure That Your Water Is Crystal Clear with help from the pro's at Robinson Pump Service, Inc. 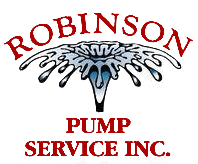 When your well pump isn't working properly, turn to Robinson Pump Service, Inc. for repair, replacement or water treatment. We've been ensuring that residents of the Belleview and Ocala, FL area have water in their homes for over three decades. Speak with the well water pump contractor at Robinson Pump Service today about your project. We can install water softeners as well as a whole house water filter. Never worry about well water pump issues in your home again with Robinson Pump Service handling your job. Schedule an appointment right away by calling 352-307-4699 or 352-817-3245.